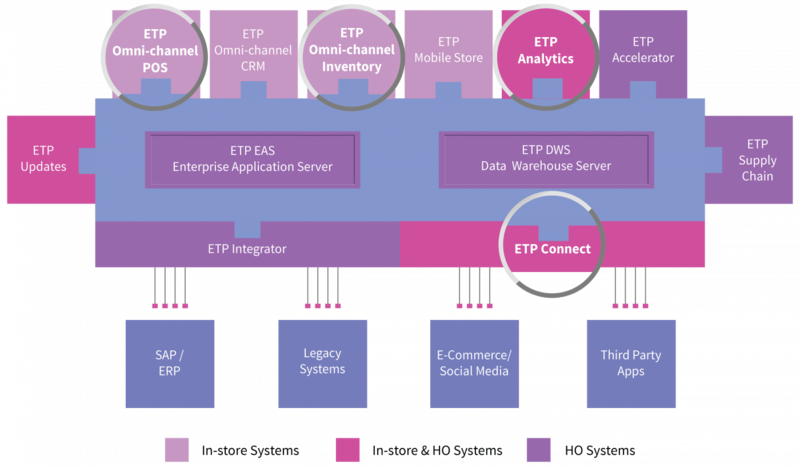 The ETP Omni-channel Retail Solution provides seamless omni-channel integration for e-commerce, brick-and-mortar stores as well as all other customer touch points. It enables brands to interface with personalized physical and digital retail channels that help to engage better with and create extraordinary value for both the retailer and the end consumers. ETP V5 Omni-channel for E-commerce software comprising Omni-channel POS for e-commerce, Omni-channel Analytics, Omni-channel Inventory Management and Omni-channel Connect provide you with features such as Click and Collect, Click and Deliver, Endless Aisle, easy omni-channel returns & exchanges, a holistic view of the inventory, and a single view of the customer, enabling you to deliver a unified brand-customer relationship across all channels. ETP’s Omni-channel for E-commerce platform makes the process of migrating from e-commerce to omni-channel easy and seamless and enables you to offer a superior shopping experience to your end customers and improve your bottom-line.